As you may know, I eat a Paleo diet to manage food intolerance symptoms as it naturally excludes foodstuffs that promote auto-immunity (such as the lectins in pulses and casein in dairy). I find it really supporting to be part of a large community who choose to eat what most people would call a highly restricted diet and do so with positivity and energy. At home, my wife and I also keep our two kids as paleo as possible as both have signs of Dad's problems (sorry about that kids!). In the long run though, I am confident that this way of eating through their younger years will provide them with a rock solid basis of health. Which they're already showing with boundless energy and steady emotions. But being a Dad, I do worry what will happen as they grow older and get to choose for themselves whether they want to drink cans full of sugar in water, and of course they will have to make their own decisions about that as they encounter it. But I welcome the chance to help them understand why we eat this way that this new book provides. 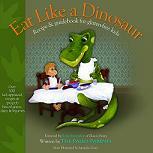 Eat Like a Dinosaur is a new book from Paleo Parents containing gluten free, casein free recipes themed for kids and containing a kids' story, which should help you indoctrinate ;-) educate your kids about healthy eating. I'll be getting myself a copy as soon as Amazon UK lists it, which I'm assured they will do soon.